A finely potted, smear glazed, stoneware teapot. The base of the teapot has an impressed 'WEDGWOOD' mark and it dates from c.1830. 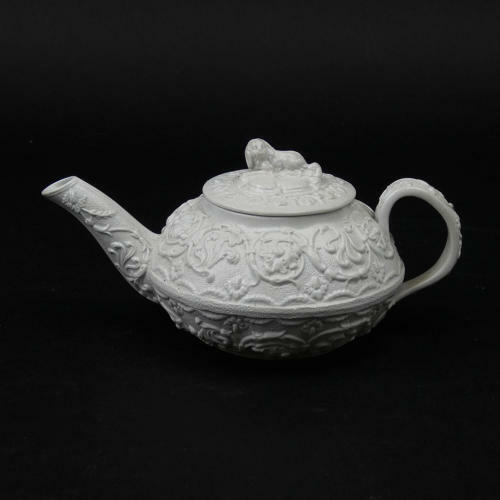 The body of the teapot is moulded with two bands of scrolls and flowers. This design often features as one of Wedgwood's border designs. The finial, on the lid, is in the shape of a spaniel sitting on a cushion. The piece is very light in weight and this is due to the fine quality of the potting. Both the pot and lid are in excellent condition.